1916 – First enlisted flight training class at Pensacola, FL. 1943 – USS Helena (CL-50) fired first proximity fused projectile in combat and shot down Japanese dive bomber in southwest Pacific. 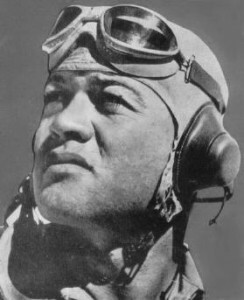 1944 – Top Marine ace MAJ Boyington captured after shooting down 28 aircraft. 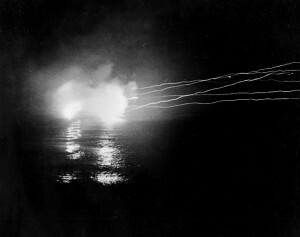 1945 – Third Fleet carriers begin a 2 day attack against Formosa destroying 100 aircraft with loss of only 22 aircraft. 1962 – Navy SEAL teams established. 1989 – Aircraft (VF-32) from USS John F. Kennedy shoot down 2 hostile Libyan Migs. 1917 – Navy places first production order for aerial photographic equipment. 1934 – VP-10F flies first non-stop formation flight from San Francisco to Pearl Harbor, arriving 11 Jan.
1944 – Aircraft from USS Block Island make first aircraft rocket attack on German submarine. 1945 – Carrier aircraft begin 2-day attack on Japanese forces, Luzon, Philippines. 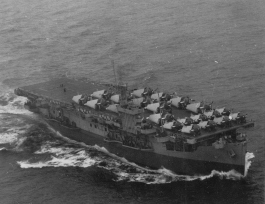 1953 – Landings tested on board USS Antietam, first angled deck carrier. 1997 – Navy physician CAPT Jerry Lineger joined the crew of the MIR space station after being launched on Atlantis during space Shuttle Mission STS-81. Prior to the mission, he was trained at the Cosmonaut Training Center in Star City, Russia for over a year. 1900 – US (CDR Taussig in USS Bennington) takes formal possession of Wake Island. 1911 – First aircraft landing on board a ship, USS Pennsylvania by Eugene Ely. 1914 – School for naval air training opens in Pensacola, FL. 1930 – USS Lexington provides power to Tacoma, WA, when floods knocked out city power plants. 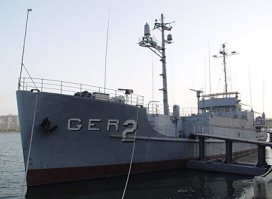 1968 – USS Pueblo seized by North Korean forces in Sea of Japan. 1991 – Operation Desert Storm, liberation of Kuwait from Iraq, begins. 1911 – 1st hydroaeroplane flight is witnessed by naval aviator. 1913 – The body of John Paul Jones is laid in its final resting place in the Chapel of Naval Academy, Annapolis, MD. 1967 – Fire in Command Module at Cape Kennedy during simulation countdown. Lunar Module Pilot LCDR Roger B. Chaffee and two other crew members died. 1981 – Era of Enlisted Naval Aviators ends when last pilot retired. 1986 – Space shuttle Challenger explodes killing CDR Michael Smith, USN, and 6 other astronauts.